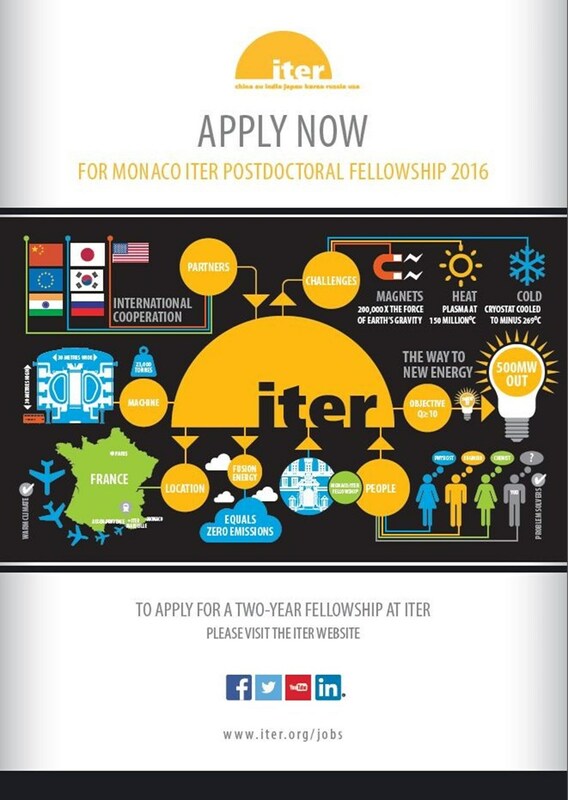 The Monaco/ITER Postdoctoral Fellowship Program is an opportunity for young researchers to participate in one of the great scientific and technical challenges of the 21st century. Since 2009, the Partnership Agreement signed between the ITER Organization and the Principality of Monaco has provided for up to five Postdoctoral Fellows to be appointed for two-year terms. The program's fifth recruitment campaign was launched on 5 January 2016, for Fellows who will begin their appointments between 1 September and 31 December 2016. Working closely with leading experts in fusion science and technology at the ITER Organization, postdoctoral fellows benefit from a unique international framework and the possibility of contributing to the development of fusion energy in a number of research areas. In 2016, these include: burning plasma physics, heating and current drive physics and technology, fusion plasma diagnostics, superconducting magnet technology, electrical engineering, mechanical engineering and structural analysis, remote handling technology, vacuum and plasma fuelling technology, cryogenics, and thermohydraulics. To qualify for the Monaco/ITER Postdoctoral Fellowship Program, you must be a national of one of the ITER Members or of the Principality of Monaco, with a PhD awarded after 1 January 2013. Please see the dedicated webpage for more information. Applications must be received by 1 March 2016.